Sale of a Vauxhall Victor F-Type at Broadway Autos of Middlesex in 1959. Homepage. This page: Details of an Austin traded in for a Vauxhall motor-car in 1959. Vauxhall Victor at Broadway Autos Ltd. Various items of paperwork relating to the cars owned by a Mr A.A. Hatcher, of East Oakley, turned up recently, and this is the first to be added in. It relates to his purchase of a 1958/1959 Vauxhall Victor (F-Type) on August 20th, 1959, against which he part-exchanged an Austin A35 (registration TGO 926), for which £400 was allowed against the Vauxhall's purchase price of £639. The supplying dealership was Broadway Autos Limited. Judging by the hand-written amendments scribbled across the top of the invoice, it seems that Broadway Autos Ltd of Cricklewood, London NW2, had re-located to - or opened up additional premises at - 155 High Street, Hampton Hill, in Middlesex. The Directors of the firm are given as H. and B. Adams, while the Salesman responsible for the part-ex of the Austin against the Vauxhall Victor (registration VCD 602) was a G.H. Cooper. 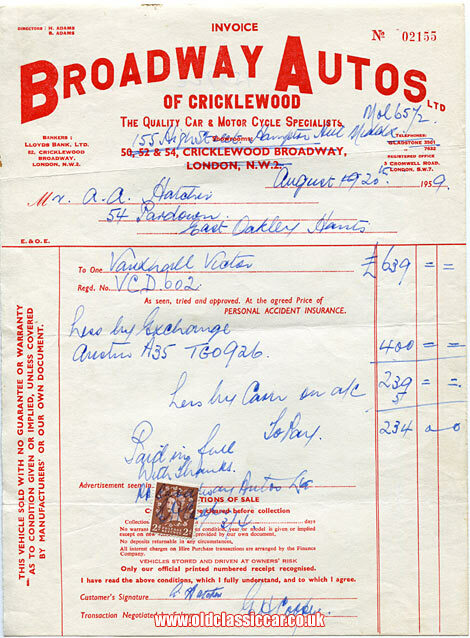 As the invoice heading suggests, Broadway Autos Limited supplied all manner of quality cars and motor-cycles. Articles elsewhere on the www refer to the company and the sale of prestigious machines such as a 1965 Ferrari 500 Superfast, a new 1966 Aston Martin DB6 Vantage, and a 1962 Mk2 Jaguar, so the company evidently had some interesting motors passing through its doors, not just family saloons such as the pair referred to in the invoice above. The addresses in Cricklewood, Broadway (numbers 50, 52 and 54) now seem to be occupied by a pub/bar, while the Hampton Hill address is in use by a wine company. A check of the DVLA site doesn't bring up any matches for the Austin's or Vauxhall's registration numbers, so both probably ended up being scrapped, piled high with assorted Austins, Fords, Hillmans, and Vauxhalls, waiting for the jaws of the crusher to do their job, under the watchful gaze of a yard's proprietor, and his oily hound. Mr Hatcher didn't keep this car long, for in July 1960, he part-exchanged it for a Victor Estate at Watson's Motors Ltd of Basingstoke.